The 15-Hour Health & Safety Training is mandated for any person wishing to become a home-based child care licensed provider in New York State. Health & Safety training is certified by the NYS OCFS. This is a competency-based curriculum that requires successful completion of written exams and demonstration tests. Health & Safety Training certificates will be given upon completion. 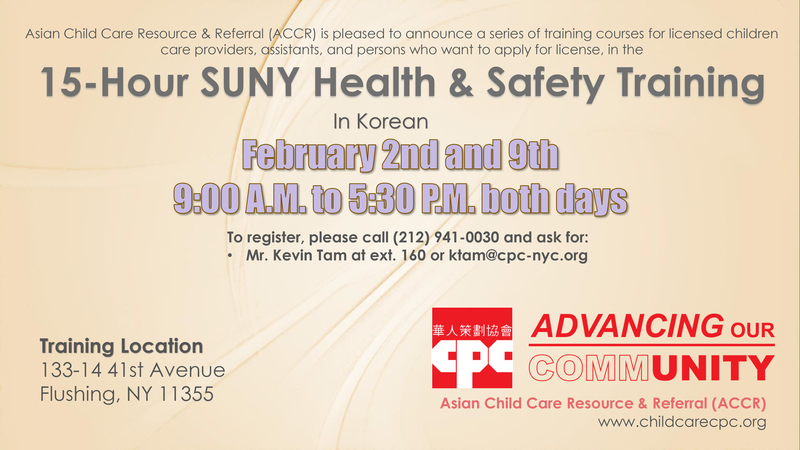 The 15-Hour Health & Safety Training in Korean begins on Saturday, February 2nd and has its second session the following Saturday, February 9th, lasting from 9:00 A.M. to 5:30 P.M. on both days.